Fully revised and rewalked 2nd edition. The Cotswold Way is a 102-mile National Trail that runs from Chipping Campden to Bath, following the beautiful Cotswold escarpment for most of its course. The trail leads through quintessentially English countryside with little villages of honey-coloured stone to the well-known town of Bath. 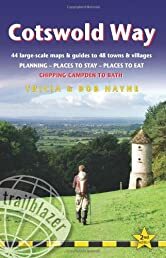 West Highland Way, 4th: British Walking Guide: planning, places to stay, places to eat; includes 53 la..
Offa's Dyke Path, 3rd: British Walking Guide: planning, places to stay, places to eat; includes 87 lar..